On April 25, 2011, three teams from BBA#16 won an award from 7th MFC Talent Award after a long six months of work! 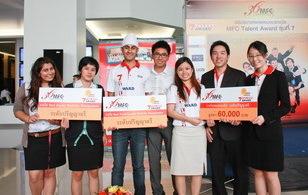 First-runner-up team consists of Paparwee Assavadakorn (Yeepoon), Koses Juariripukdee (Jot), and Pemika Ariyasantichai (May), winning a 60,000Baht prize and a trip to Hong Kong for Asset Management companies� visit namely Standard Chartered bank, AXA Group and Citigroup. The Best Equity Portfolio Management Team consists of Paveena Pathela (Nanah), Wanmukda Kusawat (Pearly) and Prim Taechachoonhakit (Prim), winning a 12,000Baht prize. 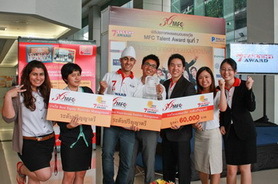 The Best Fixed-Income Portfolio Management Team consists of Pornchanok Sophonkiattikun(O+), Aekapop Guruvanich (Aek) and Poonpitchaya Pantitanonta (Peat), also winning a 12,000Baht prize. We all had a great experience and learn so much from the valuable insights and feedback from the judges i.e. fund managers, traders, and strategies from over ten Asset Management companies in Thailand. We would all like to thank MFC Asset Management Company for this unmet opportunity, and all of the support and knowledge gained from Ajarns at BBA Thammasat. Our successes could NOT come without such great professors and program! Posted date: April 28, 2011 � 14:30 hrs.